No Bust Darts | No Chest Pocket | No Side Pleats under the yoke | Genuine Coconut Shell Buttons | Side Slits | Each MauiShirts' Hawaiian apparel is unique | There are no two shirts identical to each other. 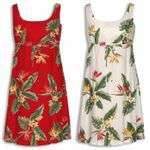 RJC Brand maker's of fine Hawaiian Aloha Mens and Womens matching clothing since 1953. There is no universal sizing system for online apparel. Each manufacturer has a different standard for their sizes. The best way to ensure a proper fit is to KNOW YOUR MEASUREMENTS. You can measure a similar shirt you own that fits you comfortably and compare the measurements to our size chart for the right fit. Order the larger size if your measurements are in between those listed above. These measurements, shown in inches, pertain to the STYLE W-Q-412O, R. J. Clancey, Shannon Marie label, Rayon Hawaiian Aloha Shirt, and have no relationship to any other shirt maker or brand name. To avoid returns or exchanges, please call the Toll Free Number, 10 A.M. to 3 P.M., local Maui Time, if you need further assistance with your size: (1-866-628-4626). Measure the fullest part of your bust for a BUST MEASUREMENT and compare to the shirt chest measurement above, leaving room for comfort. Shirt LENGTH is a straight measurement taken from the back center of the shirt, without the collar to the bottom hem of the shirt.